Healthy snacks can be fun snacks too! 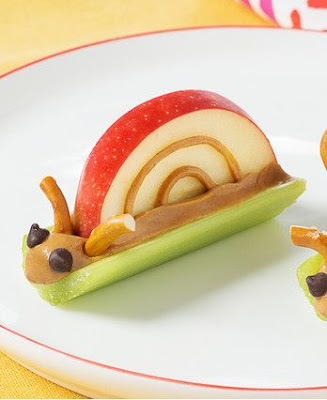 Find out how to make these super cute Peanut Butter Snails for a snack that will make even the toughest critic smile. Cut each celery rib into thirds. Fill centers with half of the peanut butter. Spoon remaining peanut butter into small resealable food storage bag; snip one corner off to make small hole. Pipe two lines of peanut butter on one side of each apple piece, following shape of apple. Insert apple pieces into peanut butter in celery pieces. Place 2 mini morsels next to each other at one end of each piece of celery to resemble eyes. Place a pretzel piece over each eye to resemble antennas. Have the kids help by placing the eyes and antennas on each snack.